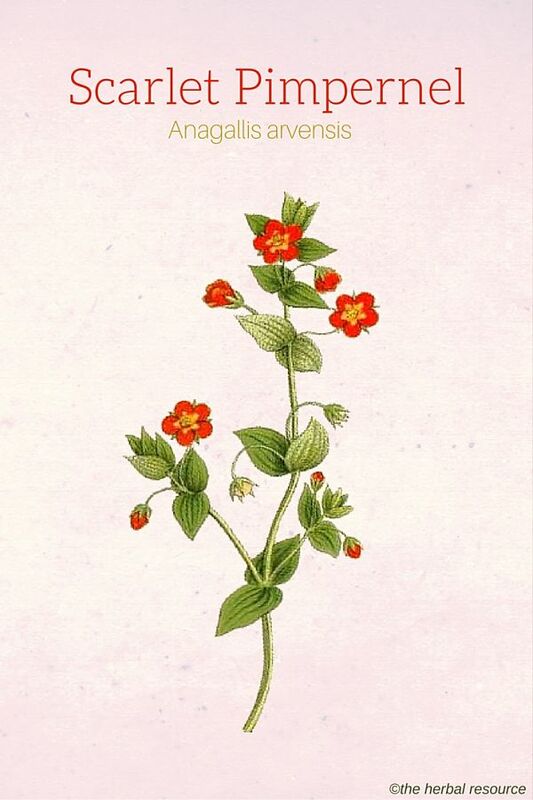 The Genus name Anagallis derives from the Greek word “anagelas”, meaning “to laugh” and probably stems from the notion of the past ages that the herb could boost mood and relieve depression. Other Common Names: Red pimpernel, pimpernel, red chickweed, poor man’s weatherglass, bird’s-eye, nonsblom (Norwegian), murajes (Spanish), mouron des champs (French), Acker-Gauchheil (German), nónblóm (Icelandic), puna-alpi (Finnish), rödmire (Swedish), rød arve (Danish). Habitat: Scarlet pimpernel is most likely native to the Mediterranean region, but has now been introduced to most parts of the world with a temperate climate. It prefers relatively sandy soil and can not tolerate shade very well. The species is spread by agricultural farming and occurs primarily as a weed in farmlands, fields, and gardens. It can also be found growing in fallow land, along roadsides and seashores. Plant Description: Scarlet pimpernel is an annual plant and a member of the primrose family (Primulaceae). It is a low-growing, somewhat erect and bare plant that can grow up to 10-30 cm in height. The stem is slightly edged and the leaves are opposite, oval or egg shaped. The red or blue flowers appear on the leaf axils and are seated individually on long shafts. Since the flower petals only have clear color on the upper side, the flowers can be difficult to detect when they are not fully opened. The scarlet pimpernel blooms from June to August. The flowers are only open for few hours during the day, and only in good and sunny weather. If it becomes cloudy or it rains, they close rapidly. The plant’s quick reaction to weather changes is reflected in one of its English common name, poor man’s weatherglass. The fruit is a spherical capsule containing many angular seeds. When the seeds are ripe they can spread by the slightest breeze. Plant Parts Used: It is mostly the above-ground parts of the plant that have been used as herbal medicine. The herb is collected in the summer and used, preferably fresh, in liquid extracts or tinctures, but it can also be used dried. The herb is odorless but has a bitter taste. Active Ingredient and Substances: Scarlet pimpernel constituents include a variety of saponins (such as anagallin and cyclamen), tannins and the substance cucurbitacin. It is especially in the root that the highly toxic saponin cyclamin is found. It was first discovered in the plant ivy-leaved cyclamen (Cyclamen hederifolium), hence the name cyclamin. It can, even in small doses, induces vomiting and diarrhea, and at higher doses cause cramps and paralysis of paralysis of the respiratory system. 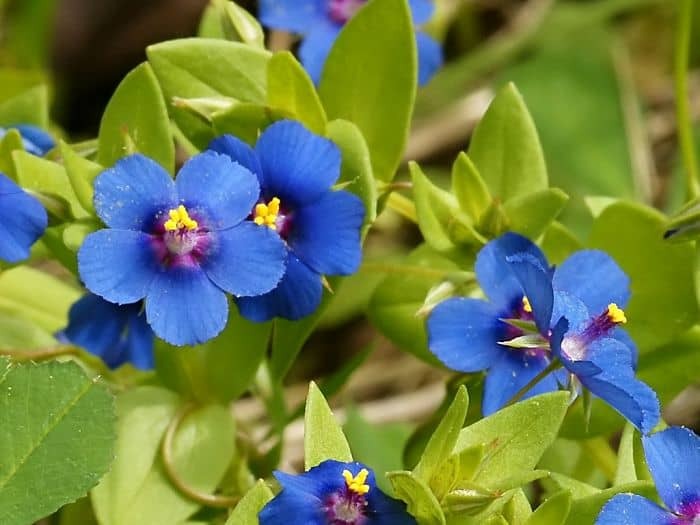 The constituents found in scarlet pimpernel can vary greatly and probably depend on several factors such as the soil composition, growing location and when the herb is collected. It has been theorized that herbalists in the past, through careful observations, had enough knowledge regarding the growing and harvesting of the plant, that they could use the herb for medicinal purposes without doing harm. If this knowledge did exist it has in most cases been forgotten and few records of it remain. 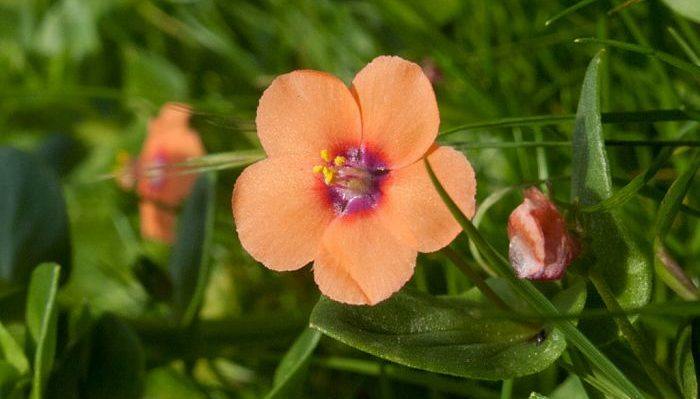 Scarlet pimpernel was once regarded highly as a medicinal plant and its uses can be dated all the way back to the times of the ancient physicians Pliny the Elder ( 23 – 79 AD) and Pedanius Dioscorides (40 – 90 AD). The plant kept a great reputation and status as an herbal medicine until the mid-1800s, but in the last hundred and fifty years or so its use has diminished, along with its application in folk medicine and traditional healing. In ancient times the herb was thought to be of benefit for melancholy and diseases of the brain, and it has been established that it was used to treat epilepsy, rabies, tuberculosis, and depression. In European folk medicine, it was once used as a medicinal herb for treating gallstones, cirrhosis, lung problems, kidney stones, urinary tract infections, dropsy, gout, and rheumatic conditions. Scarlet pimpernel is a mucilage rich plant with a diuretic, expectorant, antitussive (a cough suppressing) and diaphoretic (sweat inducing) properties. Because of these properties, the herb may be helpful in lowering high fever and expel phlegm and mucus in the chest and throat. In addition, it may be useful as an herbal remedy for the common cold or flu. Despite the herb’s many health properties, it does contain toxic substances and it is rarely applied or recommended for internal use in modern-day herbal medicine. Externally, it has sometimes has been used to treat minor wounds, cuts, and scrapes due to its astringent effect. It has also been used to relieve gout and joint pain. Juice from the plant can be rubbed on wasp and bee stings to relieve the pain and also to remove warts. It has been suggested that the herb has psychoactive properties and its ancient use for depression, might hold some truth to it and the herb can actually have therapeutic benefits in that regard. However, more studies are needed to confirm if this is the case. If scarlet pimpernel is intended for use as medicine, it must be done with great caution and only in very small doses. This herb is not suitable for self-medication and should only be used under the instructions and care of qualified health care professional knowledgeable in herbal medicine. Some herbal literature recommends it as a tea with the dosage of 0.25-0.5 g of the dried, finely cut herb in a cup of boiling water, consumed in small sips throughout the day. The whole plant contains the toxic saponin cyclamin with the highest amount present in the root. In small doses, it can cause vomiting and abdominal pain followed by diarrhea. In high doses, it can cause polyuria (excessive urination volume), tremors, convulsions and paralysis of the respiratory system which can even lead to death. Although the herb was once used as food and in cooking and given the toxicity of the herb, it is highly advisable not to include it in any kind of cooking or as an ingredient in salads. The plant contains saponins that are known to cause an external allergic reaction such skin irritations and rash in some people.